You will be able to improve your knowledge of the Spanish language in Málaga and simultaneously get to know an amazing city. The mixture of beach and culture makes this city one of the most popular destinations for vacations. There’s a reason, Málaga’s coast is called Costa del Sol (“Coast of the Sun”): They have more than 300 days of sun per year. During your stay, you will attend a Spanish class which will employ one of the most successful methods of teaching a foreign language: Learning by doing! You will be learning the words in class and be able to apply your newly gained knowledge immediately during the following leisure time activities which have been adapted to your curriculum. This way, learning the language will be even easier since theory and practical application will go hand in hand. Don’t we all know the problem: What good is vocabulary if you cannot use it? You will have time for yourself to enjoy the ocean, get some sun, go shopping, and to get to know Pedregalejo , the district you’ll be living in. Our programme is quite diverse, you may choose to go kayaking in Maro, one of Costa del Sol’s most popular bays, to participate in an adventurous trip along the breathtaking Caminito del Rey („The King's Little Path“) or to visit one of the many museums, such as the Pablo Picasso Museum. During your 10-day stay, you will see Córdoba as well which, 1,000 years ago, was one of the richest cities of the world when it came to wealth, architecture, and cultural diversity. It used to be the capital of the Western world where only the best scientists, astronomers, and mathematicians of their time would reside. Córdoba is also home to one of the most impressive monuments: Mezquita-Catedral (Mosque of Cordoba). During your stay, you will attend a Spanish class which will employ one of the most successful methods of teaching a foreign language: Learning by doing! You will be learning the words in class and be able to apply your newly gained knowledge immediately during the following leisure time activities which have been adapted to your curriculum. This way, learning the language will be even easier since theory and practical application will go hand in hand. Don’t we all know the problem: What good is vocabulary if you cannot use it? 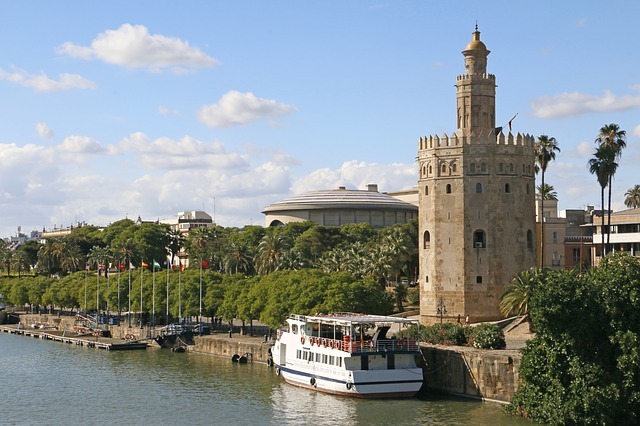 Improve your Spanish skills and discover Sevilla, the Andalusian capital. It has a lot to offer. Discover its Arabic heritage and be ready to be amazed: While in the Mosque-Cathedral you will witness the clash of two cultures, you will see a harmony of these two out in the streets of the city itself, see for example Torre del Oro or Reales Alcazares, where a catholic king was in charge of building a palace which would include typical elements of Muslim art for he was enchanted by their beauty. 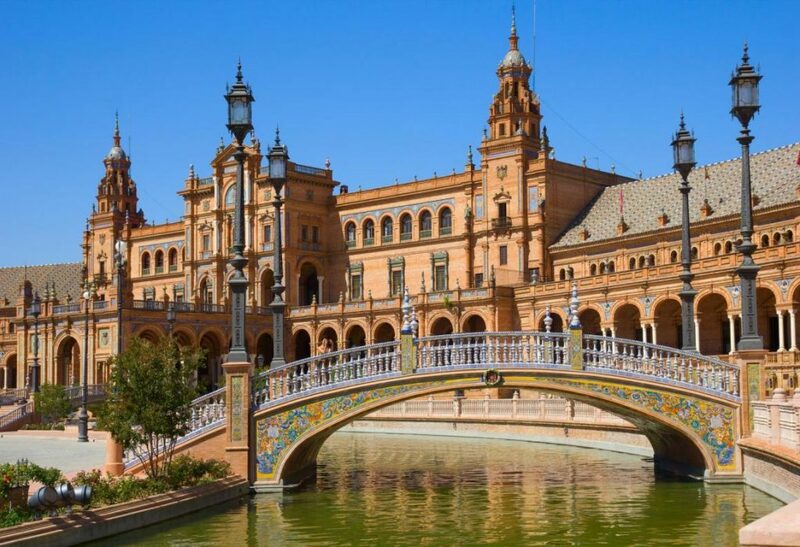 You will also visit Plaza de España where movies such as Star Wars have been shot.